Sink into the supreme softness of these down alternative European pillows. This pack of two Euro squares are the perfect inserts for your decorative pillow cases or as replacements for accents pillows that have lost their plumpness. When I opened these pillows, I was disgusted to find that one of pillows was stained with blood. This makes me think it must have been previously used and returned. I should have thrown them out, but I went through the process of returning them, and I wasn't even issued a full refund. I complained to customer service and didn't receive a response. I do not recommend these pillows, and I will not be ordering from overstock again. I still can't believe that I have been charged for a product that was unsanitary and unusable. The pillows fit decorative square pillow cases perfectly. These pillows were just what I needed to "stuff" my Woolrich Williamsport Grey Knitted 26 X 26 inch Euro Shams. They are nice and fluffy. Great buy! Nice and firm! I ordered two set but only receive one. 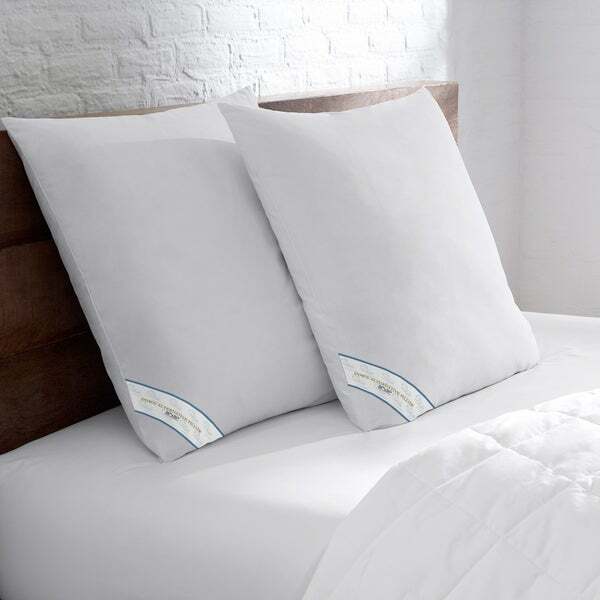 These pillows have that hotel quality weight that I like and the price was awesome. I will definitely but more because I love sets with these types of pillows! This are not firm enough to stay upright.The sink in the middle. I bought them for my European pillow shams and even when propped up with a full-sized pillow in front of them, they slouch down. These pillows are great quality and look perfect on my bed. They are comfortable and tall enough to sit up in bed and read or use my computer. My shams look so crisp. Love the shape and size. My bedding looks complete with these pillows. I would buy these again. Nice enough for cost. They are a little soft for using as display pillows but great to sleep on. These pillows stand up great , shams look wonderful. They have a medium firmness . I love them. Returned these pillows. They were flat when I received them and hoped after several days they would fill out. They did not. Happy for the price. Mid grade quality. Using in a guest room, I don't think they would be all that durable. So far seem like great quality pillows. Total misrepresentation of actual product received. Packaging was falling apart. Pillow were in plastic bags, not as pictured in ad, and falling out of packaging. They are cheaply made and lumpy. Could only use them to stuff the dog’s bed. Worst purchase ever. Total waste of my money. The comforter set I purchased has two euro square shams. I purchased these to use for those shams. wanted new euro sham pillows for my all new bed. I ordered some sham covers and need to stuff them with pillows. This seems a good quality pillow and it is on sale!